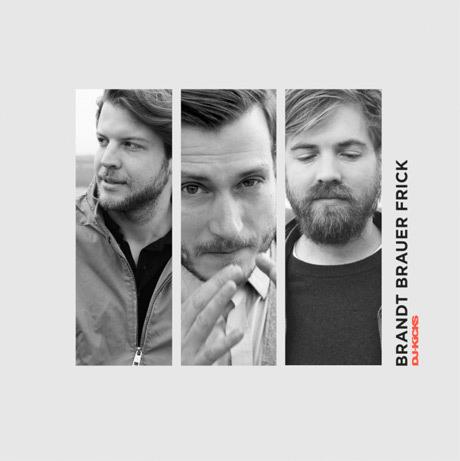 Getting your own instalment of the long-running DJ-Kicks series is a milestone achievement in the electronic music world, and classically minded experimental Berlin unit Brandt Brauer Frick can now count themselves a part of a legacy that includes Four Tet, Kruder & Dorfmeister, John Talabot and many more. The trio's specially curated mix drops February 25 through !K7. The compilation comes off the heels of the group's semi-recent Miami LP, also issued via !K7 this year, and features some of their own tunes sequenced together with tracks from Thundercat, Machinedrum, Theo Parrish, Bok Bok and more. A press release notes that the group recorded their mix in one day at Berlin's legendary Watergate club, using tracks that had previously been issued elsewhere with exclusive tracks. According to the outfit, the key was to capture the mix live in-the-moment. "Because we mixed it live there are mistakes and flaws, some rougher transitions in there," the group's Paul Frick said in a statement. "We are not super technical DJs. We like it when you hear those imprecisions because it's human. It feels like someone is behind the mix, rather than a computer." Brandt Brauer Frick composed three tracks specifically for the mix: "Bommel," "Out of Tash" and "Hugo." The first track, a synth-scorched thumper, can be streamed now via the player down below, while "Hugo" was apparently also made for people to move it in the club. The all-electronic approach was a change for the band, who tend to bring more traditional instruments into their techo-flavoured compositions. "We're known for using acoustic instruments, but there are lots of synthesizers in our music too," Frick continued. "The main element in all the three tracks we wrote for the mix is a synth. 'Hugo' is something made for the dancefloor. Often we don't think about the dancefloor at all, but that one we did." Also contributing exclusive cuts are Dollkraut, Le K, James Braun & Troels Abrahamsen, Glenn Astro and Cosmin TRG. You'll find the tracklisting infor down below. 1. Jan Jelinek - "HipBird"
3. Theo Parrish - "Electric Alleycat"
5. William Onyeabor - "Better Change Your Mind"
6. Max Graef - "Bummse"
8. Kingdom - "Stalker Ha"
10. Alfabet (Awanto 3 & Tom Trago) - "Lap The Music"
11. Fantastic Man - "Late At Night"
14. Peverelist - "Sun Dance"
15. DJ Do Bass - "To Catchy"
16. French Fries - "White Screen"
17. Chico Mann - "Soul Freedom"
21. Bok Bok & Tom Trago - "Vector"
24. Jam City - "How We Relate To The Body"
25. Brandt Brauer Frick - "Hugo (DJ-Kicks)"
26. Machinedrum - "Now U Know Tha Deal 4 Real"
28. Dean Blunt - "Galice"